The criminal globalist elite are working fast and furious to conquer Canada! This is especially noticeable in Alberta, the western Canadian province bordering Montana! While the bitter conquest-through-immigration plan is frustrated now in many countries, it still surges ahead under Trudeau! Indeed, the shill prime minister is urging Canada to let any non-qualified immigrant vote in the upcoming election! Bordering Montana, the immediate prognosis for Alberta is very dark. Marxist Minister of Education, David Eggen, notorious for his Marxist education push in 1984-1987 Zimbabwe, is working non-stop for all 61 Alberta private schools to close in 2019! 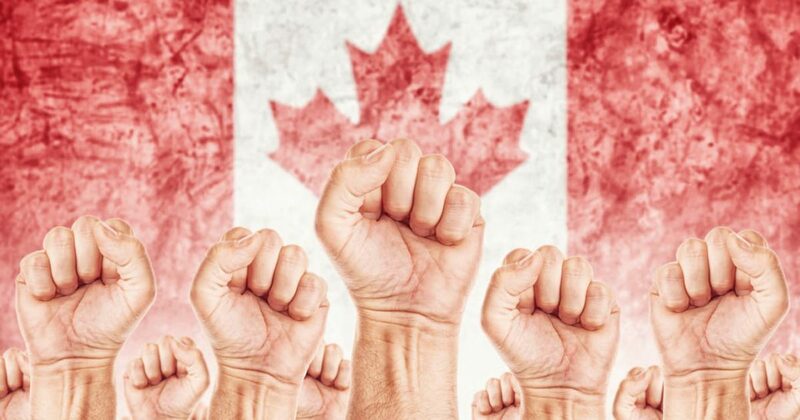 Simultaneously, Marxist Minister David Eggen is taking rapid action “against racism.” Before listing what this anti-freedom push is about, it’s important to first understand how “racism” is used in Canada, and elsewhere. Trotsky (Bronstein) invented the word “racism.” Prior to that dark moment, it was not in the Bible or any dictionary. Trotsky witnessed growing European resistance to his quiet invasion of foreigners, into European cultures, and so invented the words “racist” and “racism” to get the “moral high ground” for his Marxist internationalist takeover of Europe, using foreigners as proxies to de-nationalize. The Marxist Eggen in Alberta uses “racism” the way Trotsky intended! It is to get the “moral high ground” making one feel deep guilt and troubled – extreme false guilt – if one doesn’t let Communist Chinese and Sharia-inevitable political Islam take over. Think Trotsky. To be anti-racist is to be anti-Marxist, anti-Communist, anti-criminal globalist. It’s at the Montana border. Under the flimsy excuse they are needed for truck-inspecting recruits, 23 ballistic armor vests with external equipment is ordered and pre-positioned in Edmonton. Needed for truck-inspecting recruits? No historical precedent exists for this. More and more immigrants are allowed into Alberta police forces. Their first allegiance is to their ethnic groups and not to Canadian nationalism. It is racist [Think Trotsky] if you protest! Seniors, the aged, the elderly, in Alberta, are endlessly victimized by care home and nursing home increasing services’ cost and increased rental to pay monthly “Carbon Tax.” Carbon Tax is the dark fund for Marxist internationalist world government. The foreign workers with English as a second language make these seniors daily feel as if they’re exiled to a foreign country. Infiltrated churches have either closed or become mosques, warehouses, torn down, or private homes often for Trotsky’s ever-dominating immigrants. Select Alberta city parks are already dominated by conquest-through-immigration groups. Think Trotsky and Click here! Canadians, especially Albertans, are being rapidly dispossessed of their vestiges of Christian culture – while being made to pay for the dispossession agenda. Their MSM Fake News deluge of hatred for Trump and his policies guarantee their demise and destruction.